No one ever thought our neighborhood would flood; we are not in a flood zone and never had issues before. On Friday, August 12, the rain started. After hours of heavy rain, the roads around us began to flood, making it impossible to evacuate. So my husband and I, along with our three children, did the only thing we could do – sit tight and wait. 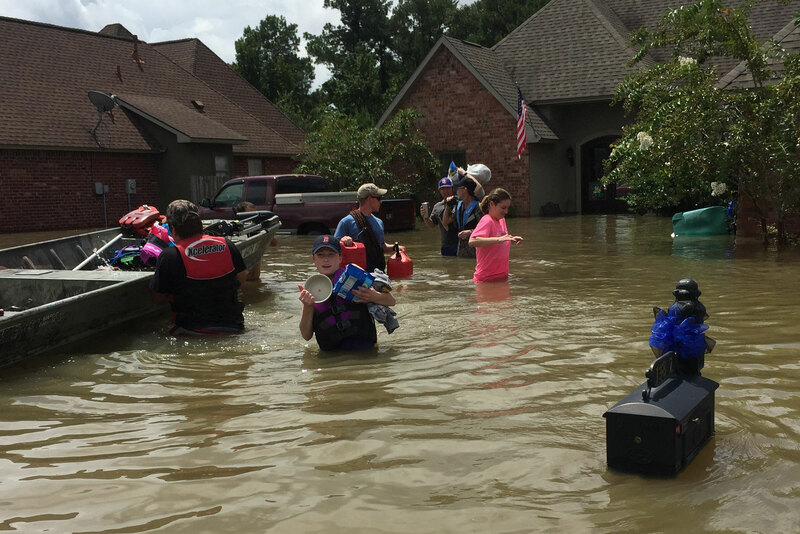 Call it woman’s intuition, but I had a feeling the water would come up, so we did our best to prepare our home and gathered all of the life jackets and anything that would float from the attic. Sunday morning, we awoke to see that the water had risen and was now at our door. 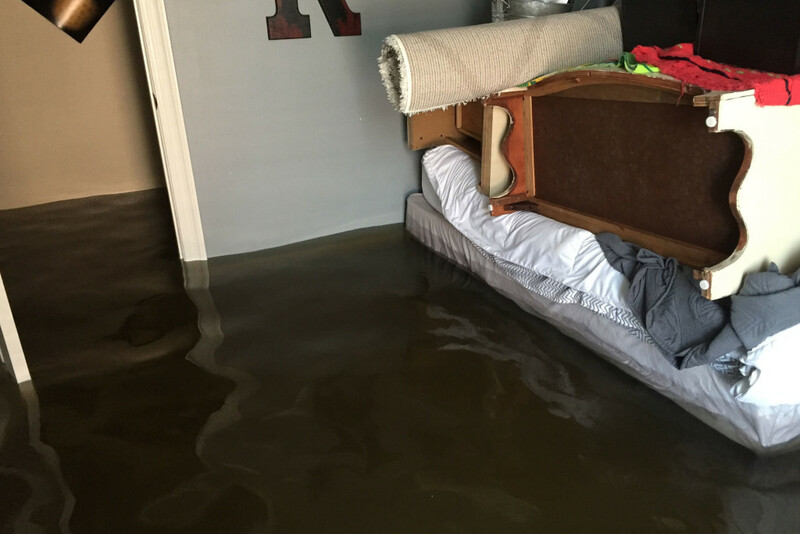 The neighbors called to be rescued at 3 a.m. We called again at 5 a.m. The water came into the house and continued to rise really fast. By this time, our phones had lost service and we could no longer call for help. The floorboards began to come up, things were floating everywhere – it wasn’t safe to stay in the house. With few options, we went to the backyard and got on the trampoline. From the backyard, we were able to watch for rescue boats over the fence. At one point, we heard a man screaming for help from across the street. We wanted to help, but the current was so strong there was no way we could get to him. 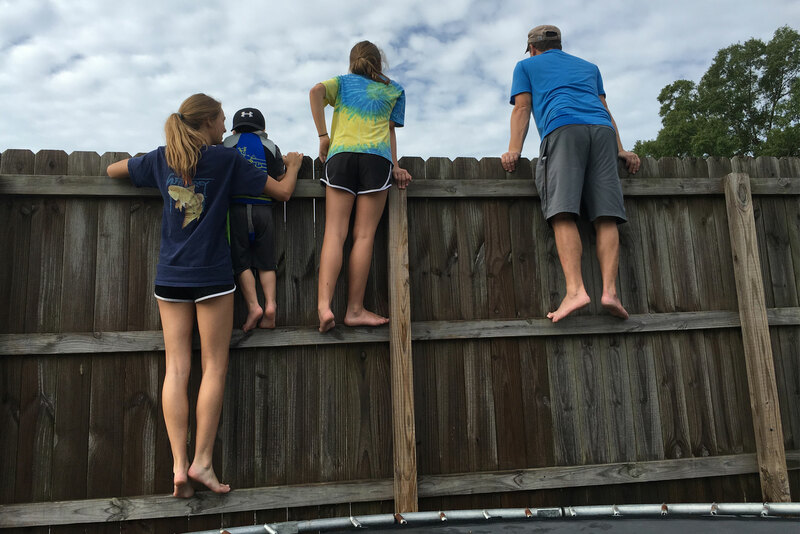 My daughter and I hung on the side of our fence and talked to him until a rescue boat passed by. We were able to direct them to him so he could be rescued. After some time had passed, we realized that my daughter’s cell phone had service. We quickly downloaded the Facebook app and posted for someone to help us. Shortly after, her phone lost service. So we continued to wait. At 12:30 p.m. I saw a boat and realized it was coming to rescue us! My brother-in-law, Phillip, and his friend, Joe, showed up to save us. My husband, 15-year-old daughter, 11-year-old daughter, 4-year-old son, myself and our two cats that were put into a backpack were finally rescued! I felt so relieved getting into the boat, but also felt guilty for having to leave my neighbors behind. The boat ride out of the neighborhood was terrifying. As we traveled, the strong current pushed the boat around causing us to hit cars, mailboxes and fences that were submerged under the water. It was devastating to see the number of people and animals who needed rescuing. Thankfully other boats began to arrive to rescue them, too. We were brought to the National Guard at 3 p.m. and they drove us to a local Walmart parking lot on Hwy 42. From there, my sister-in-law picked us up and brought us to her house. There were four adults, two teens, two tweens, four toddlers, two dogs and two cats all in the same house. It was chaos, but it was safe. Once the waters receded, we returned to the house. It was an awful, smelly mess and so overwhelming. Friends and family helped with the cleanup process. 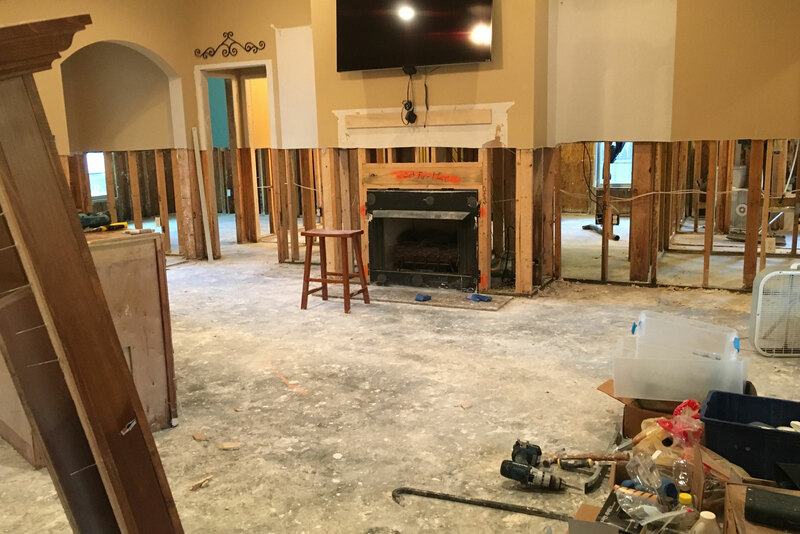 They helped us to get all the furniture, flooring, appliances, cabinets, damaged sheetrock, etc. out to the road. It was such a relief once that part was done. I knew the house could be fixed and things could be replaced, but I worried about having a safe place for my kids and for them to be able to feel normal again. Through the disaster, I received emails about rising water in Woman’s Hospital’s parking lot and my unit, Mother/Baby, being short staffed. I knew I needed to get there and help! Choosing to go back to work wasn’t hard, but I was extremely anxious about leaving my kids. My family and I were staying in Ascension Parish and the flooding started to move into the area. I couldn’t imagine them having to go through that again and me not be there to protect them. My family assured me they would be fine, and my wonderful coworker and friend offered to bring me to work, since our vehicles had flooded. When I got to the hospital, I quickly began my shift and had two patients who had also lost everything and were having to go to a shelter with their newborn babies. I was glad I could be there for them through this extremely difficult time. It was rewarding to care for them and make them feel safe for a short period of time before they were discharged. I am happy to report that my family and I are safe and sound. We are now living in a friend’s camper as we begin to rebuild our home. God has blessed us with such a brave and generous group of family and friends. My coworkers at Woman’s have been amazing! I’ve received so many calls to check on us and to offer help. They have also provided us with so much, things we didn’t realize we needed at the time! We’ve received clothes, personal items, school supplies, cat food, cleaning supplies, scrubs and so many other things to help us get back on our feet. We are so thankful for each and every one of them. I can’t thank these people enough. I am so thankful for all of the blessings we’ve received and know that we will be stronger because of these events.